Attorneys for the developer of 5775 Collins Avenue and Royal Embassy Condominium Association squared off at this month’s Design Review Board meeting over public beach access and view corridors. For its part, the City had a court reporter in the room, an unusual move unless further legal action is anticipated. Emotions are running high on this project, which also pits neighboring buildings against one another. At the end of more than three hours of legal arguments, public comment, and Board discussion, the DRB members weren’t satisfied with what they heard from the developer and voted to continue the project to a future meeting, likely December. 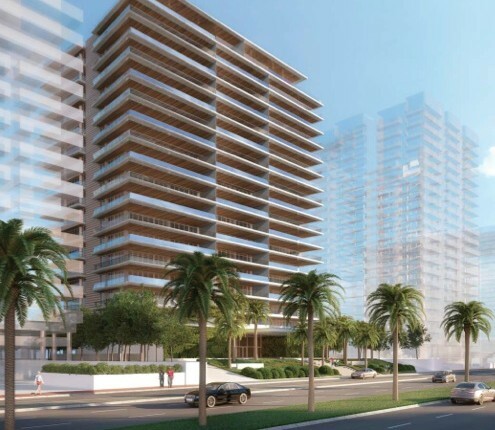 The developer, Miami Beach Associates, has proposed a new 17-story, 89 unit building that would run parallel to Collins Avenue to replace the 12-story, 107 unit Marlborough House which sits perpendicular to the street. Residents of the Royal Embassy and City Planning Staff have sought reorientation of the proposed building to allow for view corridors on a site with a building that has provided generous side views for more than 50 years. In addition, the City and residents are seeking a public beach access through the property. The owners have emphasized throughout the process that their proposal is allowed under current City Code. Murphy reiterated Planning Staff’s recommendation that the architect rotate the building orientation 90 degrees, increase side setbacks to a minimum of 50 feet along each side, and provide direct pedestrian access to the beach. Staff suggested continuing the application to December “to allow the applicant and architects generous time to reorient the building.” The developer says it doesn’t plan to do that. The crux of the legal arguments as previewed by both attorneys is whether or not the design review criteria and City’s Comprehensive Plan are as important as the zoning code. Within the Comprehensive Plan is a recommendation that new developments provide public access to the beach and bay. Deputy City Attorney Eve Boutsis referred the Board to a memo from the developer’s attorney that they would pursue a legal claim based on a Supreme Court decision on the taking of private property should the Board require public beach access. Michael Larkin, attorney for the developer, informed the Board that Miami Beach Associates has entered into settlement agreements involving financial compensation with the associations at Villa di Mare to the North and L’Excellence to the South. The City’s Comp Plan he said “does not allow the city to take private property without just compensation in violation of the Constitution”. While the plan says pedestrian access can be waived for non-residential construction, Savage said, that same waiver does not exist for residential construction. “This was so important and so fundamental to our land development regulations given this community, given its site on the beach, that public access is fundamental in all of our new residential construction,” hence the lack of qualifying language for residential properties, he argued. After some more back and forth, Larkin then made an offer, “This is a well funded developer, that’s for sure, and they could certainly engage in long costly litigation with regard to beach access if you all would impose a condition making it mandatory. But in giving it a lot of thought, they have decided on a voluntary basis that they could grant beach access through their private property. There are many arguments against it and I’ve been happy to advance them to you all today but as a practical matter what they want to do, they don’t want to be perceived as a billionaire bully, which was the term coined in the [Miami] Herald based on the urging of certain residents. They don’t want to be perceived in that light. So in order to avoid this costly litigation they certainly would be willing to provide this pedestrian access which you’ve seen has dominated this discussion.” He suggested a 5-foot easement with landscaping. After a straw poll indicated there were not enough votes to approve the project, Boutsis asked Larkin if they wanted the Board to deny the application or ask for a continuance. At that point, more than three hours after the discussion began, the Board voted to continue the application to December.